‘exoskeleton’. They are soft for about 2 to 3 hours; then their shell starts to turn hard again. markets from April through September. 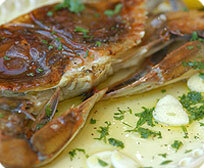 Soft shell crabs are a seasonal Venetian treat as well. There they are referred to as moleche. until they have molted, at which point they are taken to markets. pasta or a salad , or as the filling for a delicious sandwich. Warm the olive oil in a large skillet over low heat. Add the garlic and red pepper flakes; cook for 2-3 minutes. Add the crabs, cover, and cook over low to medium-low for 10 minutes. Turn the crabs over halfway through the cooking time. When the crabs are done, transfer to a plate and tent with foil to keep warm. While the crabs are cooking, bring a pot of salted water to a boil. Cook the pasta for 2 minutes less than the recommended cooking time. After removing the crabs, add 2 cups of wine to the skillet. Bring the wine to a boil and reduce by half. Add the diced tomatoes; cook over medium-high heat for about 3 minutes. Stir in the butter and cook to thicken slightly, about 1 minute. Season the sauce with salt and pepper; stir in the parsley. Drain the pasta and add it to the sauce in the skillet; toss gently to combine. You can ask your fishmonger to clean the crabs for you. Here is the technique if you wish to do it yourself. 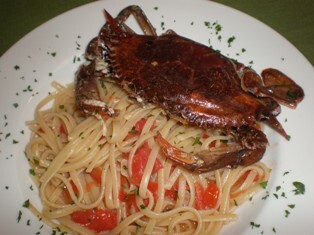 To clean a soft-shell crab, you must first remove the ‘face’ of the crab. This is most easily done with a pair of kitchen shears. Make a quick cut across the top of the crab, removing the eyes and ‘head’. The next step is to remove the apron. Flip the crab over on its back, and you will find a large flap which you can pull away from the crab. Again using kitchen shears, cut this flap off. Some people also like to remove the lungs, which you can do through the cut you made as you removed the head.